The Moroccan city of Agadir is laid out near the point at which the Souss River flows into the Atlantic Ocean and it has become a popular winter sun destination for many Europeans in recent times. Visiting golfers are well catered for here with three modern golf complexes – 27-hole l'Ocean, 27-hole Dunes and 36-hole du Soleil – laid out close to each other on the south side of city. Those in the know, however, avoid these two tourist traps and head for the Royal Golf Club Agadir a few miles further inland. The origins of this delightful course in the mid 1950s are somewhat sketchy with its original layout attributed to “a mysterious Scotsman known only as Mr. Wilson”. A few years later, longstanding member and Club President Colonel Kamili is credited with improving the routing to that which is in play today. 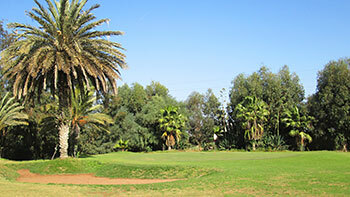 The triangular shaped property is very compact with just enough room to lay out a 9-hole circuit and Royal Agadir has been described as “a deliciously romantic golf course” where fairways are bounded by pine and eucalyptus trees and greens are protected by both bunkers and palm trees. The signature hole is regarded as the 515-yard par five 3rd which plays to a small, circular two-tiered green. There are no airs or graces about Royal Agadir, even with a retired Colonel as an ever-present figure lurking in the background. Colonel Kamili, who has been instrumental in the club’s development for many years now, plays nine holes most days and is normally found around the clubhouse attending to admin matters of some sort or another. The course is a delight, not taxing in any way in terms of length, but beautifully undulating fairways are narrow and greens are tiny (mostly circular in shape with some of them subtly two-tiered) and very lightly bunkered. Interestingly, the short par four 4th, measuring 207-metres, is really a long par three and the 186-metre 6th, which IS a par three, has a stroke index rating of 1 on the scorecard! There are some lovely raised greens, as at holes 6 and 8, which were re-laid around ten years ago, thanks to “Jimmy” – another mysterious Scotsman in the club’s history who worked in Spain but who also returned from time to time to help with course improvements, according to Director of Golf Mohamed Leli Liaoui. Mohamed also pointed out to me Colonel Kamili going about his daily business as usual, and he very kindly took time to have a few words about the course and the club in general. What struck me about our conversation was just how lucky we are to have little places like this that survive on a shoestring budget but which are still prepared to introduce youngsters from the local housing estates to the game without any outside financial assistance from either the government or the Royal Moroccan Golf Federation. Clubs like this deserve support from either official sources or from commercial sponsors and I’d dearly love to hear from Mohamed if Royal Agadir manages to secure funding for such a worthwhile local community project – and one that has apparently produced some fine nationally represented players in recent years. If you're ever in Agadir and planning to visit one of the other three golf resorts here then save a morning or afternoon to sample this little golfing oasis, where a round of golf with a caddy costs less than 20 quid.